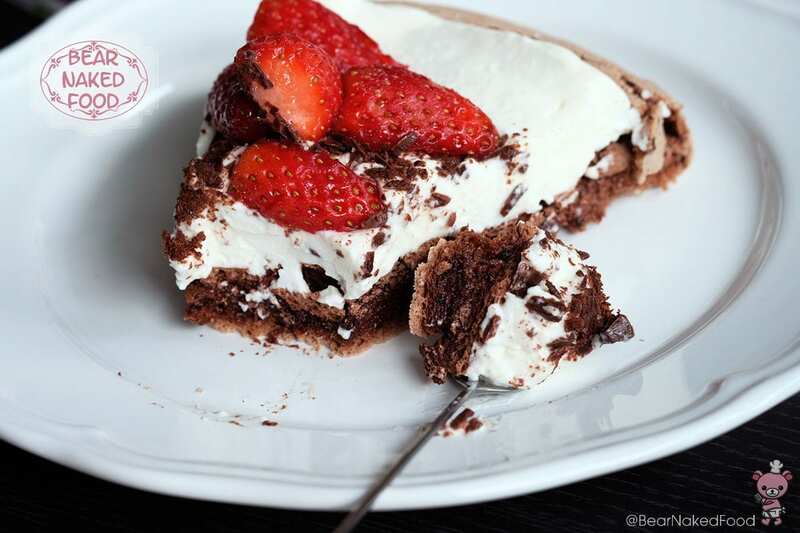 This Double Chocolate Pavlova with Mascarpone Cream is made with one of my favorite girlfriends in mind. 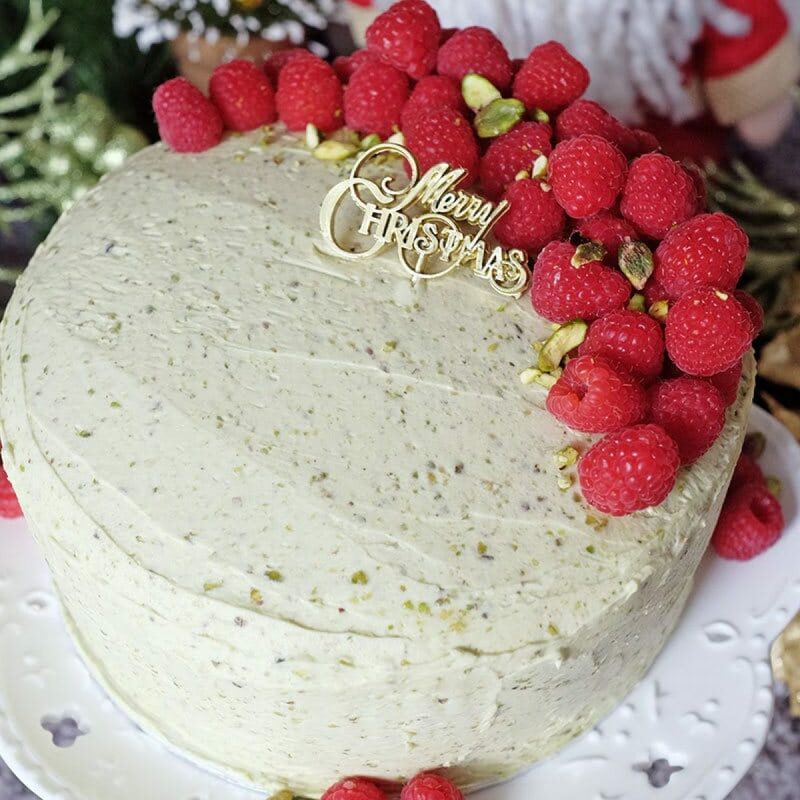 She is a huge fan of chocolate, meringue and also gluten-intolerant. Action speaks louder than words, I actually made this for her birthday (few weeks back) and hand delivered it right to her door. 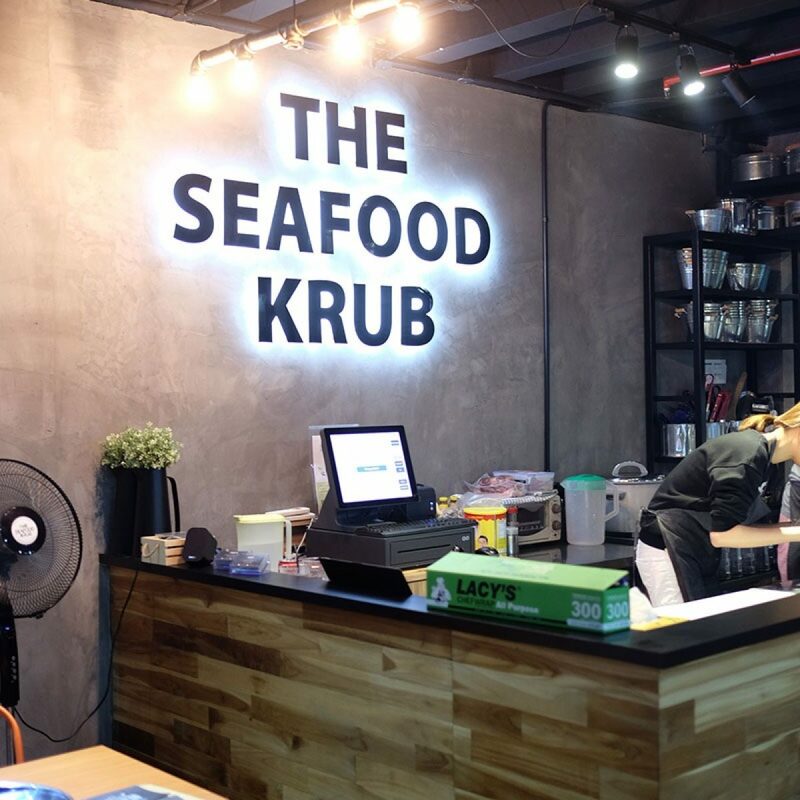 And yes, it lasted the 25-min journey and kept well in the fridge even till the next day. 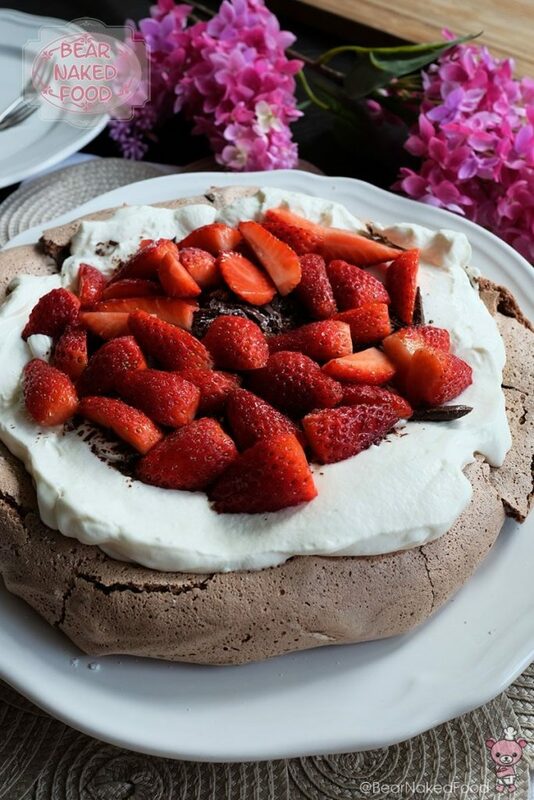 In case you are wondering what is Pavlova, it is a chewy marshmallow-like meringue shell made with egg whites and sugar topped with cream and fresh fruits. Sounds simple enough and it really is. 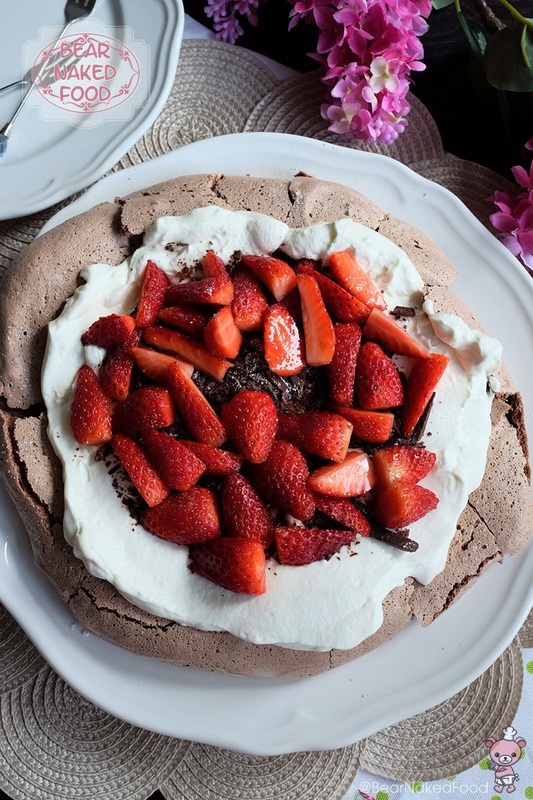 This chocolatey twist to the classic Pavlova recipe makes it a huge hit at dinner parties and a breath of fresh air to the classic cake desserts we are used to. Making the meringue shell feels intimating to most but if you follow the steps below and have faith in yourself, chances of failure is almost minimal. 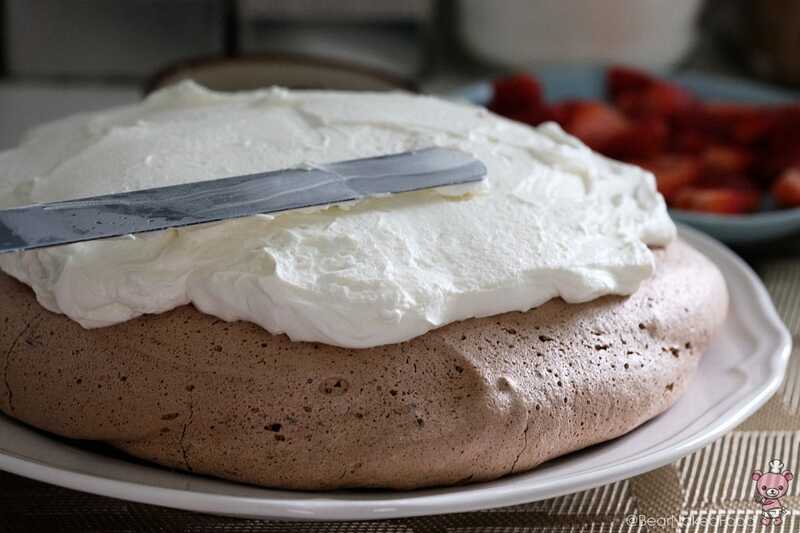 There is no fear of over-whipping the meringue as the amount of sugar used helps to stabilize the egg whites so try not to reduce the quantity stated. 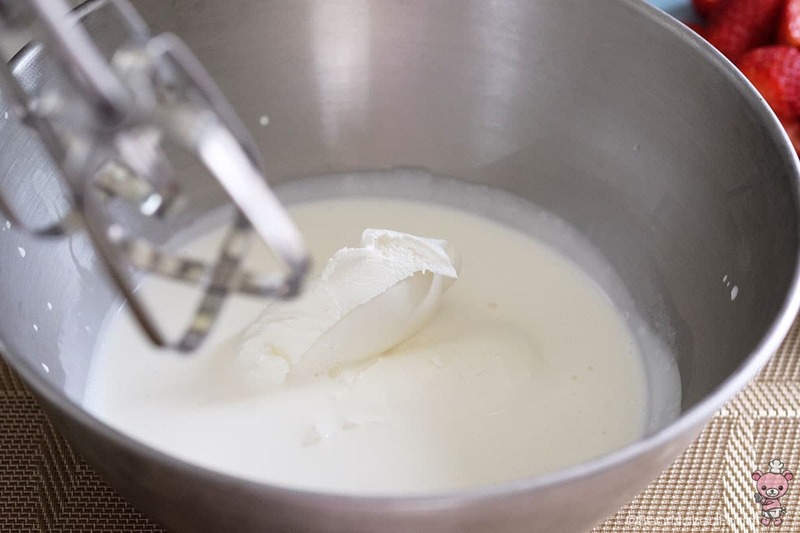 Lastly, adding mascarpone cream helps to lighten the overall texture but if you have trouble getting it, you could simply omit and substitute fully with heavy whipping cream. 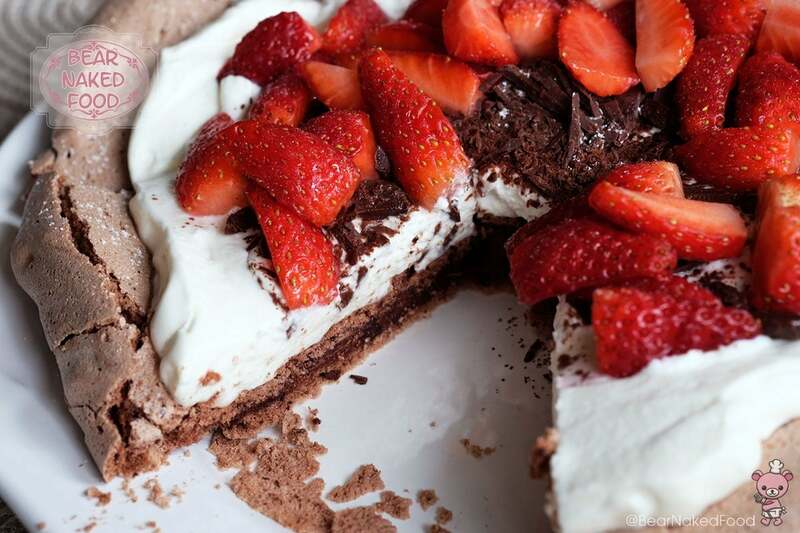 Your Pavlova will still taste good. 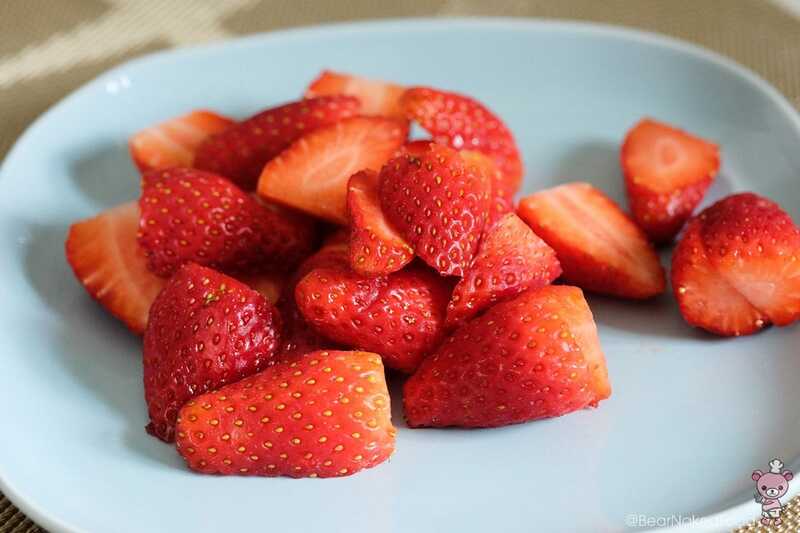 I’m using strawberries (just cos they are in season and a nice color contrast) as the fruit topping, feel free to use blueberries, raspberries or any other types of fruit you fancy. 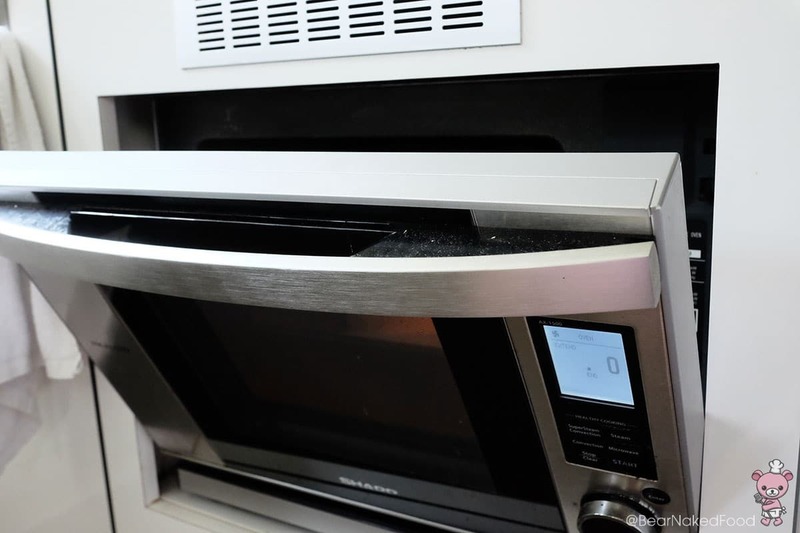 Preheat oven to 150°C/300°F (lower to 140°C if using fan-forced). 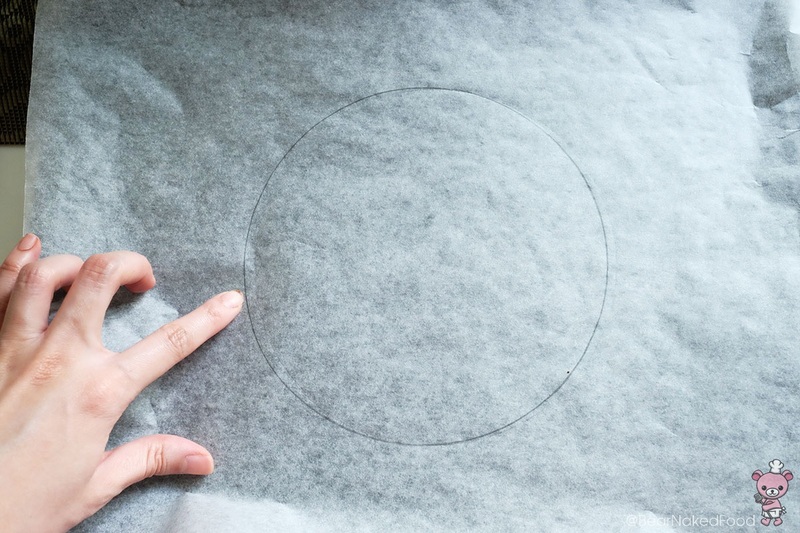 Line a baking tray with non-stick baking paper and roughly draw a 6-inch circle. Flip the paper over so the ink does not transfer to the meringue later. 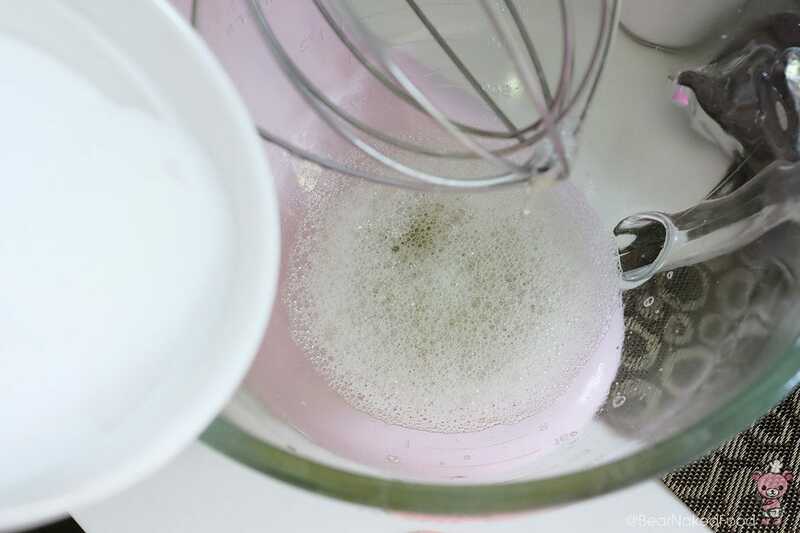 Put the egg whites and salt in a large and use an electric or hand mixer to whisk them on low speed until foamy, about one minute. 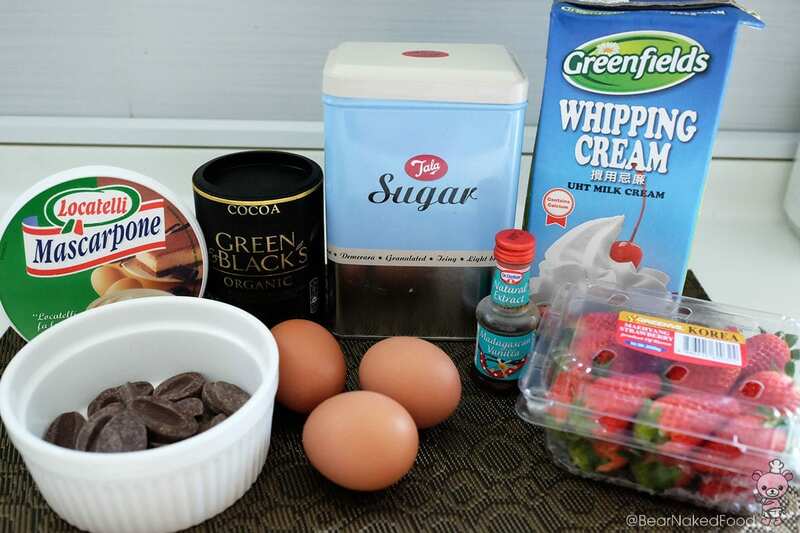 Increase speed to medium and gradually add in the sugar while the mixer is on. 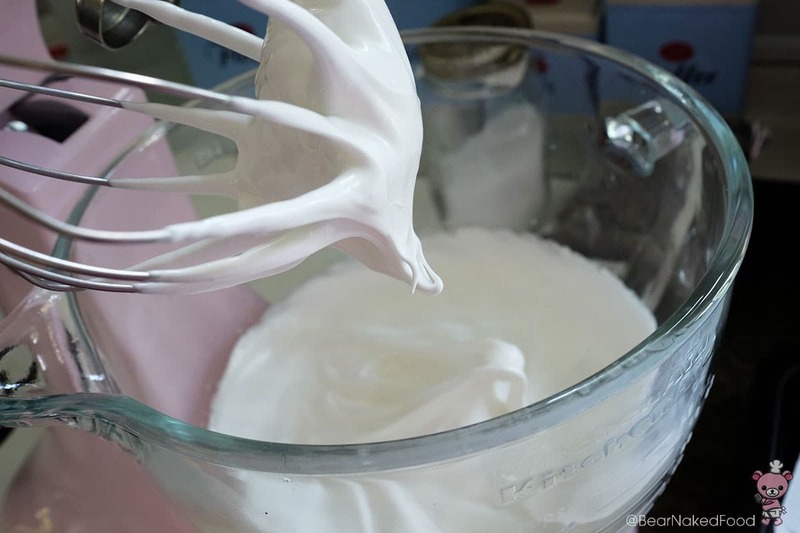 Continue to whisk the meringue until stiff peaks and glossy, about 7 – 8 minutes. 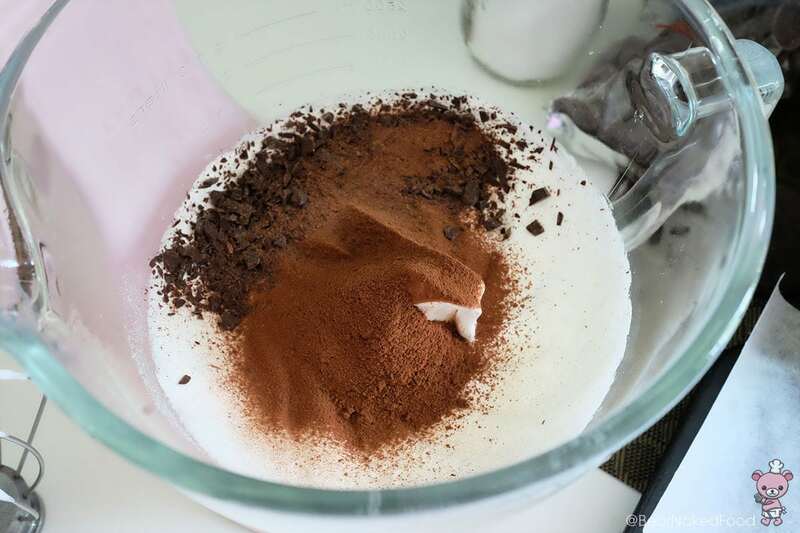 Sift the cocoa powder into the meringue and add in vinegar and chopped chocolate. 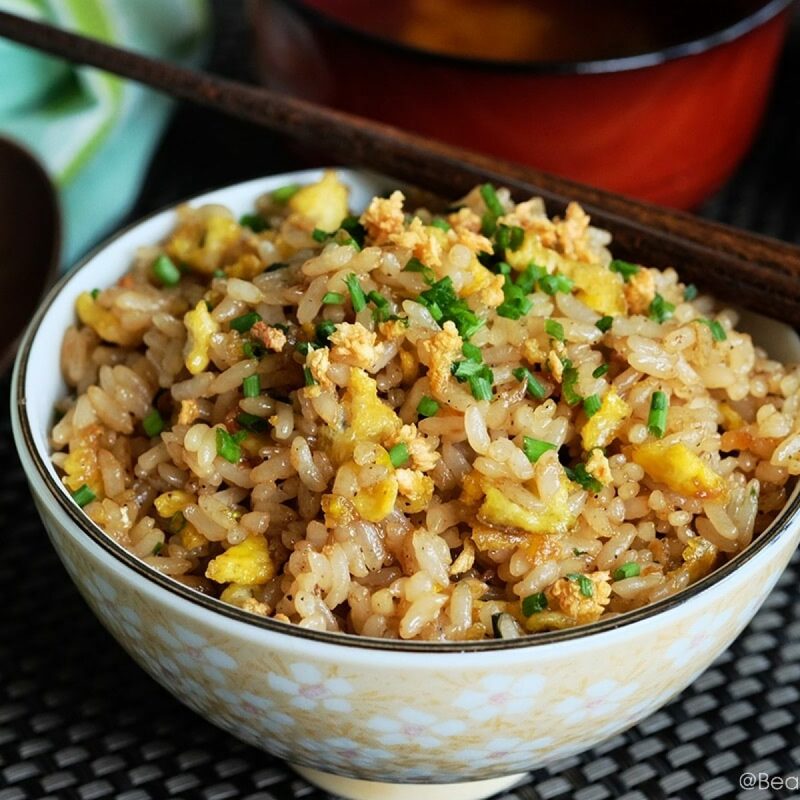 Use a spatula and fold until just combined. It should be a light mocha color with no streaks or cocoa. 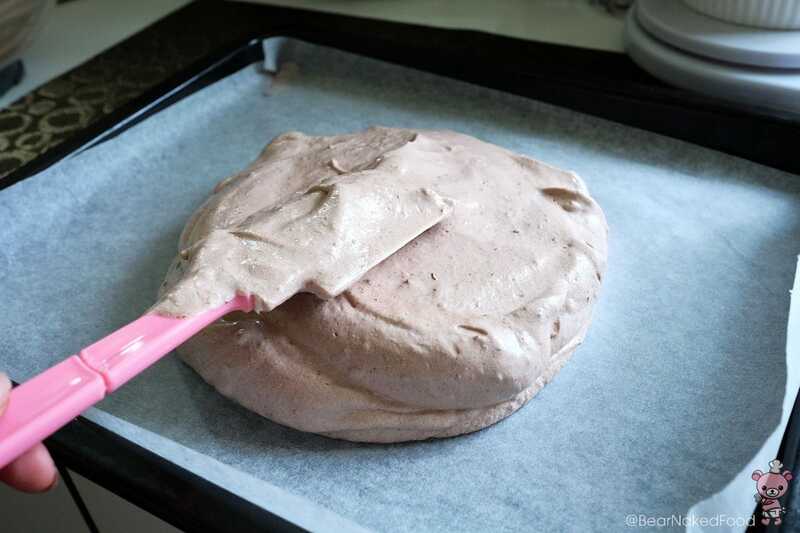 Pour the meringue onto the marked baking paper and use a spatula to spread it evenly. 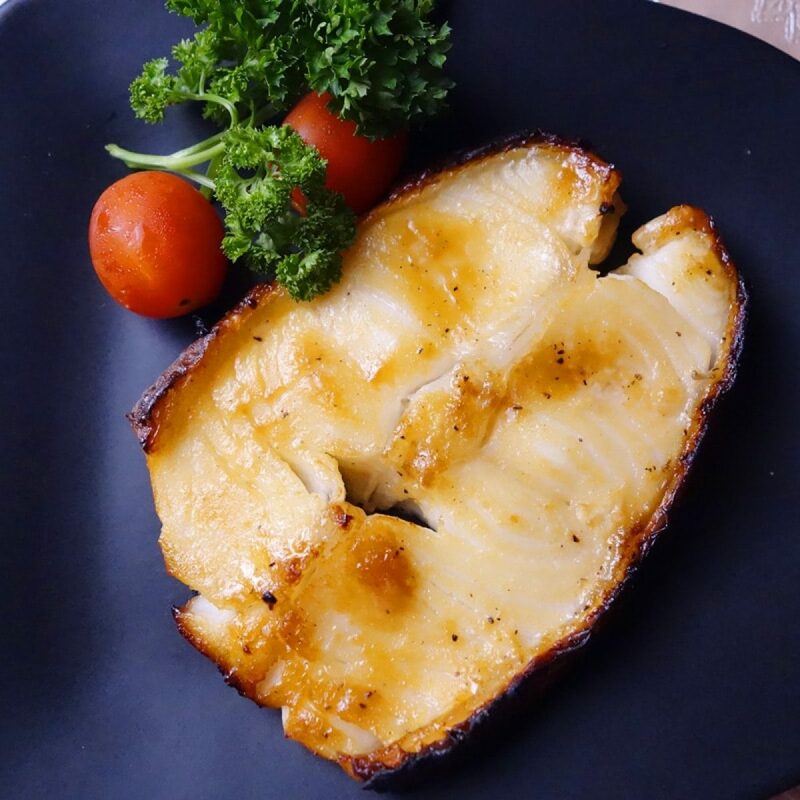 It does not need to be perfect or evenly smooth. 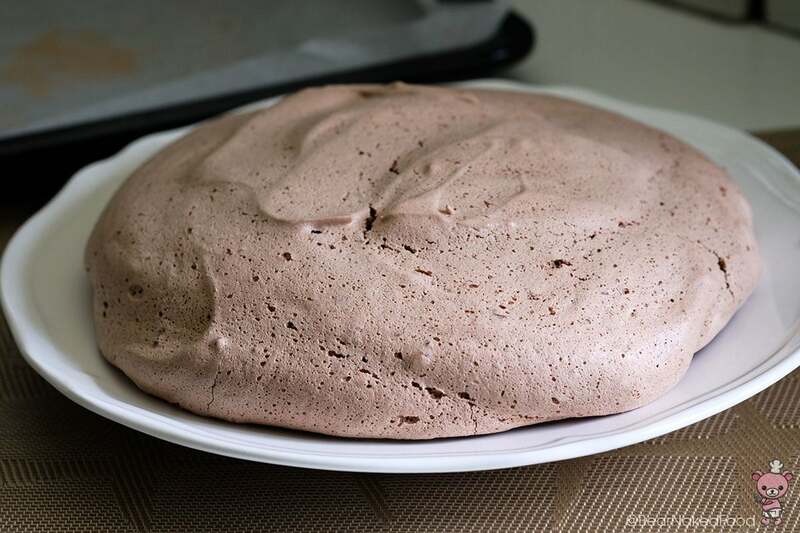 Do not overwork the meringue or it will deflate. 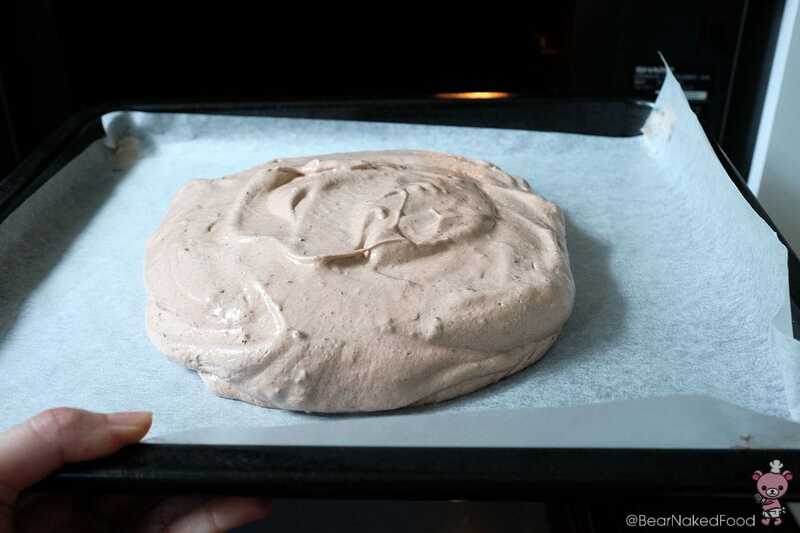 Place in pre-heated oven and bake for 45 – 50 mins until the meringue is puffed and crisp all over, yet slightly soft in the middle. 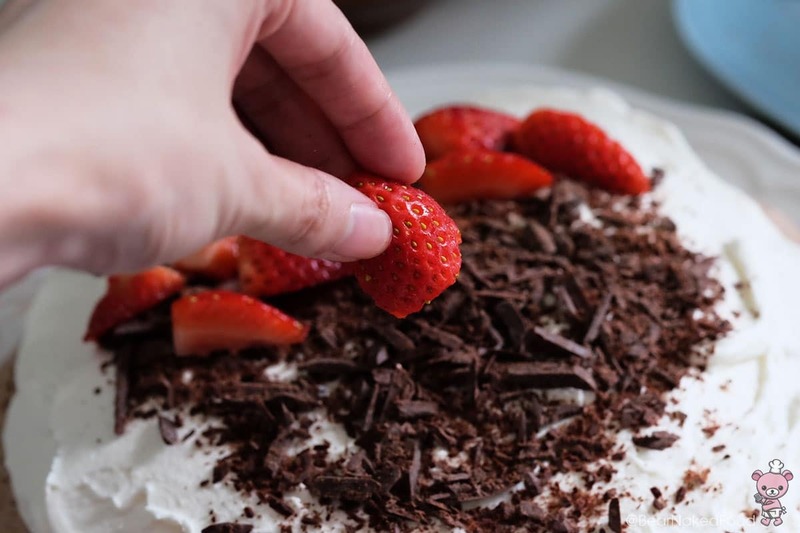 Do not worry about the cracks as that is very normal and will be covered by the mascarpone cream later. 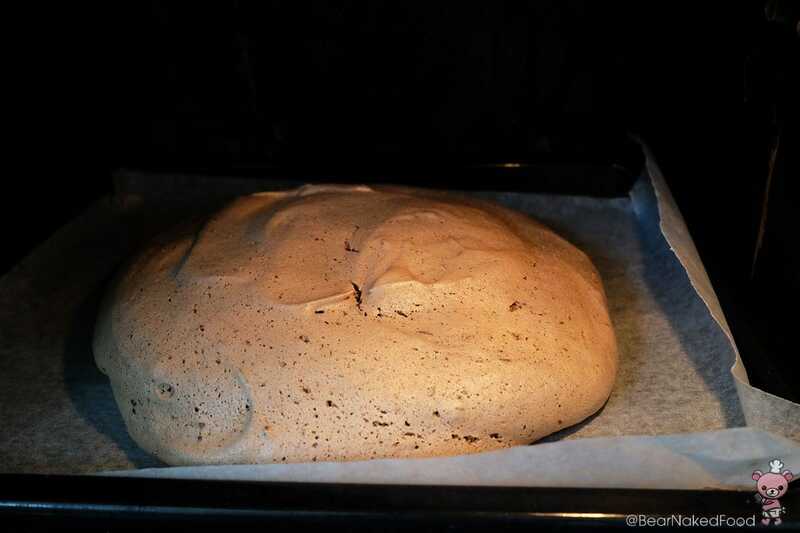 Turn off the oven and open the oven door slightly and let it meringue cool completely inside. This will minimize the sinking of the meringue. 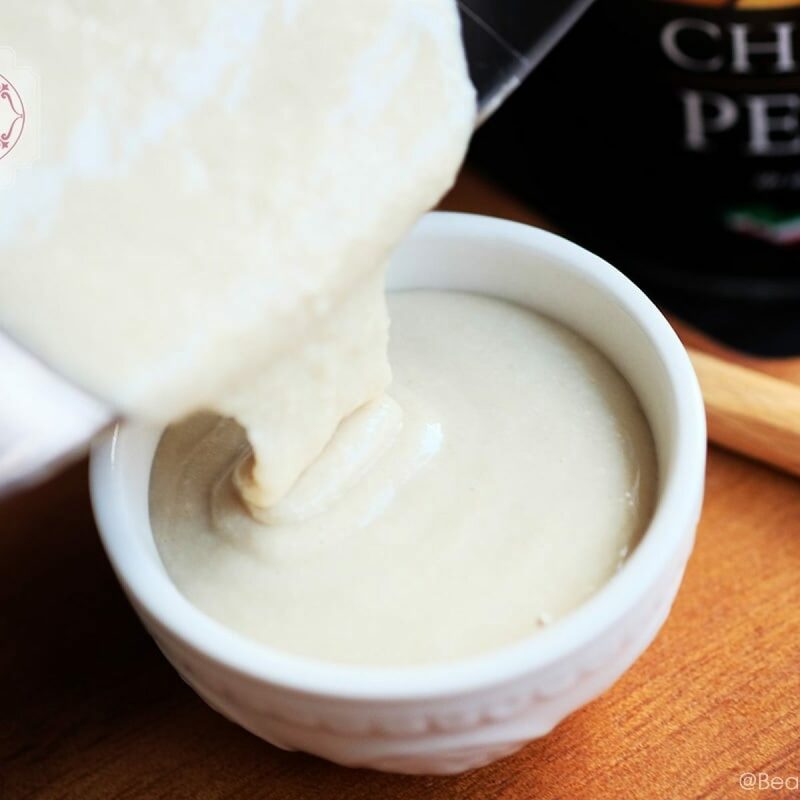 Using a hand whisk or electric mixer, beat the mascarpone, whipping cream, and vanilla extract until combined. Add in the sugar and continue to beat until soft peaks. Do not over beat the mixture or it’ll become grainy. 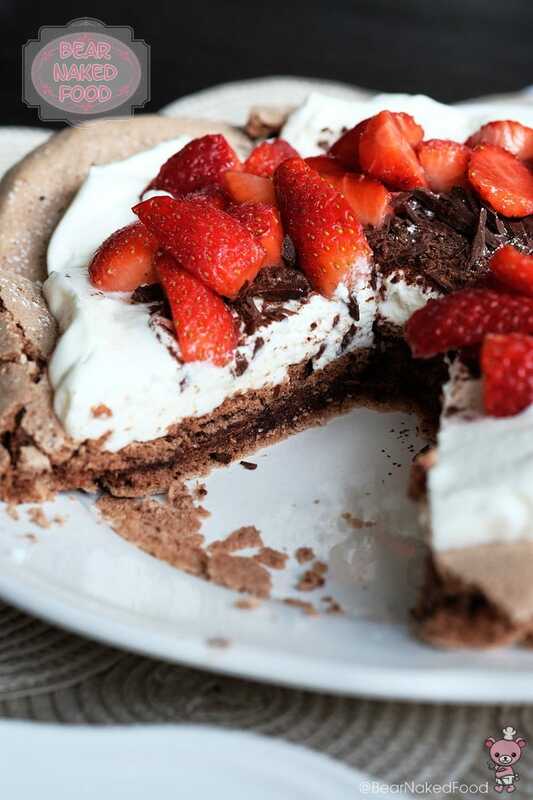 Carefully peel off the cooled meringue shell from the baking paper and set on the serving tray. 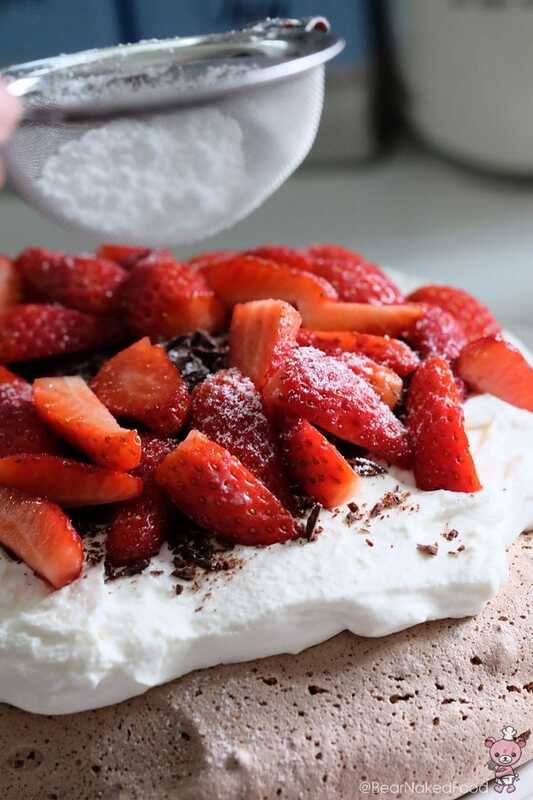 Spread the whipped cream on top of the meringue. 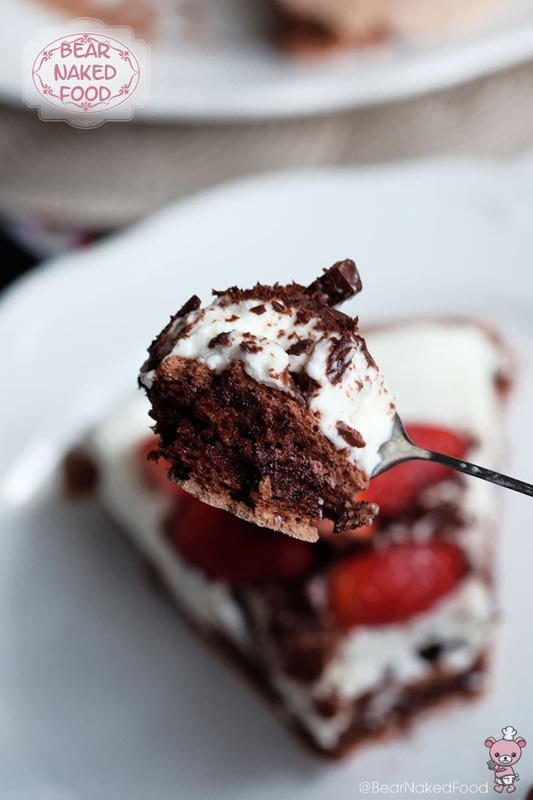 Top with shaved chocolate and fresh strawberries. Note: You could make this up to 12 hours ahead of time before serving. Keep refrigerated. 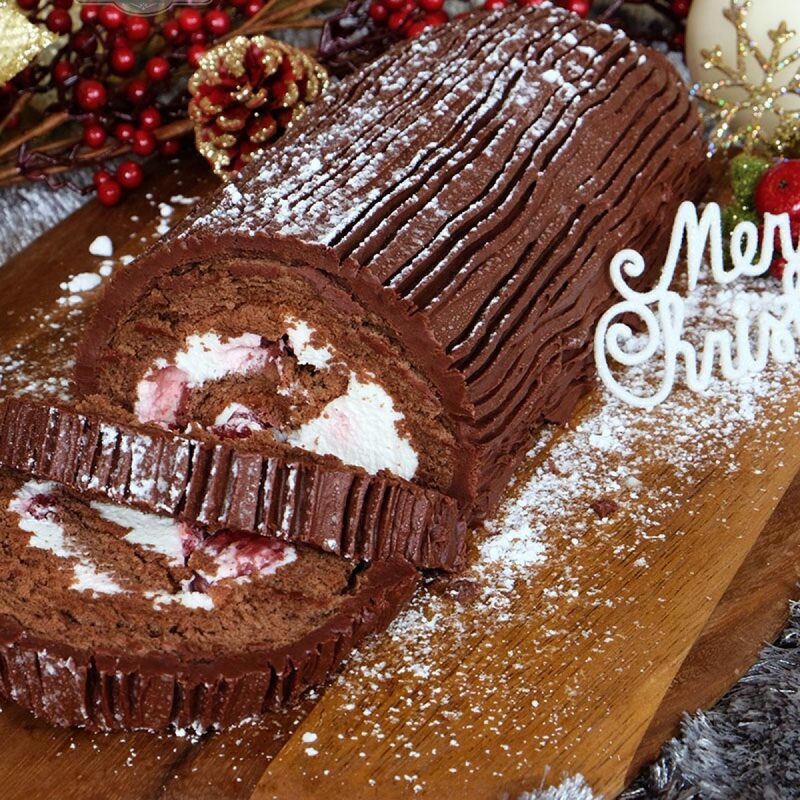 I like to dust the top with some icing sugar. Place in pre-heated oven and bake for 45 - 50 mins until the meringue is puffed and crisp all over, yet slightly soft in the middle. 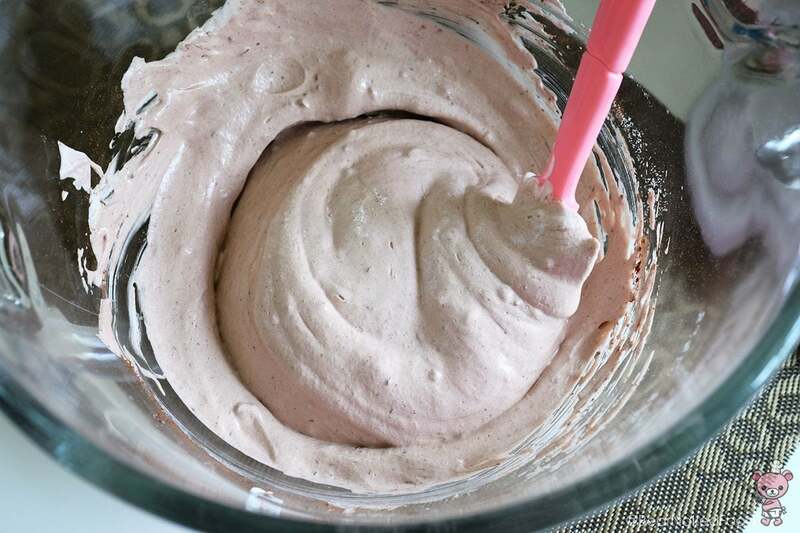 Using a hand whisk or electric mixer, beat the mascarpone, whipping cream, and vanilla extract until combined. Add in the sugar and continue to beat until soft peaks. Do not over beat the mixture or it’ll become grainy.